CRE8’s solution for Normally Unmanned Installation (NUI), successfully delivered to Oseberg Vestflanken. 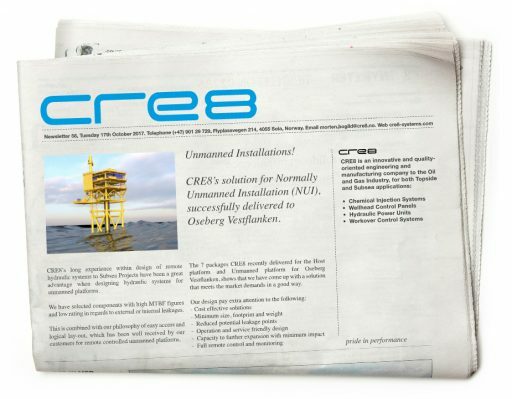 CRE8’s long experience within design of remote hydraulic systems to Subsea Projects have been a great advantage when designing hydraulic systems for unmanned platforms. We have selected components with high MTBF figures and low rating in regards to external or internal leakages. This is combined with our philosophy of easy access and logical lay-out, which has been well received by our customers for remote controlled unmanned platforms. The 7 packages CRE8 recently delivered for the Host platform and Unmanned platform for Oseberg Vestflanken, shows that we have come up with a solution that meets the market demands in a good way.